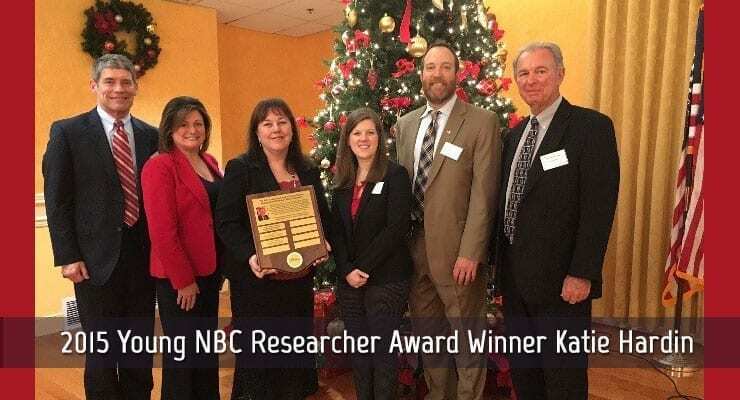 Battelle research scientist Katie (DeMers) Hardin has been named the 2015 recipient of the Dr. Billy Richardson Young NBC Researcher Award. Hardin is the second Battelle researcher to have received this award since 2013. The award, given by the NBC Industry Group, recognizes exceptional young leaders with dedication to activities involving education and commitment to nuclear, biological and chemical (NBC) defense. Hardin accepted her award during a Dec. 10 luncheon in Aberdeen, Maryland. A $1,000 donation will be made in her name to the Aberdeen Science and Math Academy. Katie Hardin has focused much of her research at Battelle in the area of Chemical, Biological, Radiological, Nuclear and Explosives (CBRNE) defense. She has worked at Battelle for 11 years, the last nine of those in chemical detector developmental test and evaluation (T&E). She has actively led detector T&E tasks that equate to over $12 million for numerous government entities. “In addition to research and leadership responsibilities within her specific field, Hardin is a tireless advocate for educating the CBRNE Defense mission across Battelle,” said Matt Shaw, general manager of the CBRNE Defense business. Hardin is the leader of Battelle’s CBRNE Defense NetComm organization, which focuses on improving communication and networking across all disciplines within CBRNE Defense and Battelle. In 2014 Hardin organized a CBRNE Defense Technology Showcase, a key event which highlighted over two dozen of Battelle’s current top technologies. At this first-of-its-kind event, Battelle research staff had the opportunity to learn more about CBRNE Defense technologies as well as network to identify potential collaborations with other CBRNE Defense research teams and individuals. The event also drew attendees from Ohio’s Congressional delegation, local media and Battelle senior leadership. Hardin has also led the CBRNE Defense NetComm organization in establishing a new internal marketing event—Open Houses. This past year Battelle has successfully held five of these Open House events showcasing CBRNE Defense laboratories/facilities across multiple Battelle locations. Additionally, as an elected member of the Emerging Scientists and Engineering Council (ESEC), Hardin organized an event known as the Battelle Innovation Gathering (BIG) — designed to empower emerging scientists to champion their own ideas for internal R&D and, ultimately, external funding. Hardin’s reach and desire to mentor and foster science education extends out into the community where she works with schools, judges science fairs and participates in Women in Science and Engineering events. The Dr. Billy Richardson Award was established to recognize exceptional young leaders with dedication and passion for any and all activities involving education and commitment to NBC defense. Richardson was one of the founding members of NBC Industry Group and its first chairman in 1996. He was a leader and champion of all things pertaining to the health of the NBC Community, both the government component and the industrial base. For 25 years, Dr. Richardson was instrumental in the development of modern chemical and biological defense programs. He served as the Deputy Assistant to the Secretary of Defense for Chemical and Biological Matters and as the Technical Director of the U.S. Army Chemical Research, Development and Engineering Center. In these roles he developed the concept which led to the creation of the DoD Domestic Preparedness Program, started the Air Force development efforts in chemical defense, and was a key architect of the concept and plan for the Army’s chemical and biological defense laboratories. Image courtesy of Battelle, adapted. Battelle is an official sponsor of Global Biodefense.